It’s a new year and whether you’re sluggishly getting back into the work routine or diving into it, the new year always brings excitement and anticipation of what is to come. To me, it’s starting the first blank page of a new book. It has 365 pages and I am the author. New Year Resolutions are all part of the new year process. How many times I get asked if I have set myself a new year resolution is confounding. I don’t set new year resolutions per say but I definitely set myself goals. Both from a personal and business perspective. Setting goals are crucial as you need to have something to work towards. Whether they are basic goals like getting fit, eating healthy or reading more, it’s important to have them written down to ensure you hold yourself accountable. In order to meet your goals for the year, it’s so important to set actionable accomplishments – Set the goal posts. For example: if you want to read more, what is your goal. Do you want to read 1 book a month or 3 books a month? What are you trying to achieve? To dig even further, are you looking to read a certain number of fiction/non-fiction books, autobiographies, business books etc. It’s so easy to make a blanket statement like I want to read more, but you need actionable steps to make sure you reach your goal and hold yourself accountable. 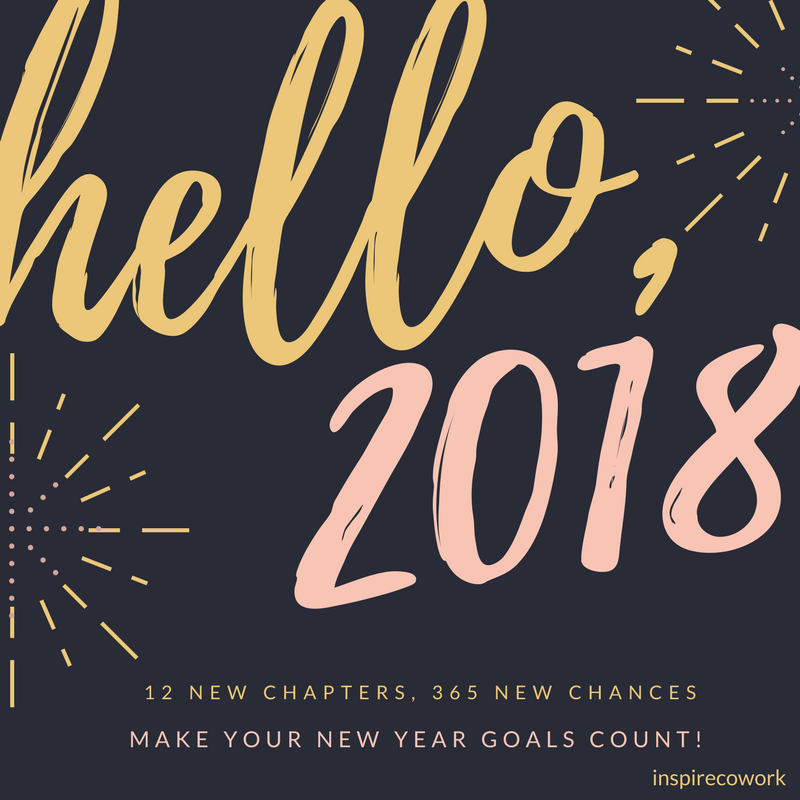 Writing my goals this year, I reflected on the past couple of years since starting Inspire Cowork and really identified where I want the business to be in 2018 and where I would like to be personally by the end of the year. It can be quite an overwhelming experience, although it also makes you feel great once you have something to reflect on and go back to throughout the year. Life gets so busy and if you don’t have a reminder of what you wanted to achieve in the year, you will probably arrive in December, feeling as though you haven’t accomplished what you set out to do at the beginning of the year. Reflect on the years that have passed and determine what you will like to see when December 2018 rolls around. Reflection allows you to be proud of what you have achieved over the years, and also gives you a wakeup call on what you have set out to achieve but have failed to complete in years passed. Break down your goals into personal and professional. Set your standards high. You will surprise yourself with how far you can go and what you can achieve if you put your mind to it. Make your goals challenging enough that they test you but not too challenging where you give up before you’ve even started. Go with the flow. There are many obstacles which will present themselves throughout the year. Stay positive. Keep calm. Trust yourself. Keep working hard. The rest will follow. Have you set your new year goals? We’d love to hear from you.